This MathematicaVsR at GitHub project is for the comparison of the Deep Learning functionalities in R/RStudio and Mathematica/Wolfram Language (WL). The project is aimed to mirror and aid the talk "Deep Learning series (session 2)" of the meetup Orlando Machine Learning and Data Science. The focus of the talk is R and Keras, so the project structure is strongly influenced by the content of the book Deep learning with R, , and the corresponding Rmd notebooks, . Some of Mathematica's notebooks repeat the material in . Some are original versions. WL's Neural Nets framework and abilities are fairly well described in the reference page "Neural Networks in the Wolfram Language overview", , and the webinar talks . The corresponding documentation pages  (R) and  (WL) can be used for a very fruitful comparison of features and abilities. Remark: With "deep learning with R" here we mean "Keras with R". Remark: An alternative to R/Keras and Mathematica/MXNet is the library H2O (that has interfaces to Java, Python, R, Scala.) See project's directory R.H2O for examples. "Neural network layers primer" slideshow. The slideshow is part of Sebastian Bodenstein's presentation at Wolfram U.
ORLMLDS Deep learning series (2): "Using Keras with R (... and MXNet with WL)". Deep learning can be used for both supervised and unsupervised learning. In this project we concentrate on supervised learning. 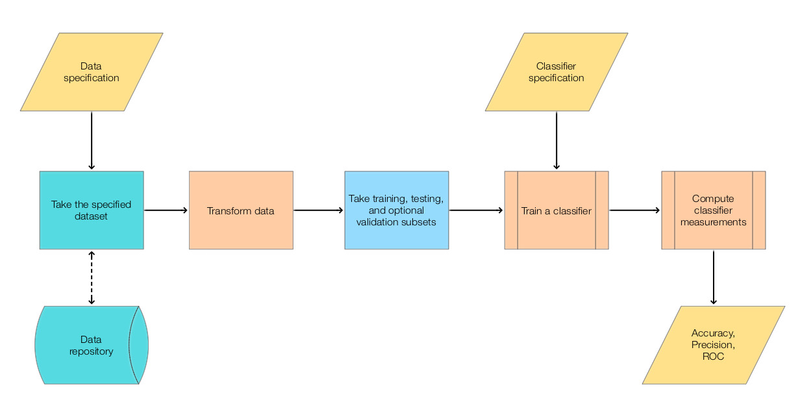 The following diagram outlines the general, simple classification workflow we have in mind. Some additional Python installation is required. The Mathematica encoders (for neural networks and generally for machine learning tasks) are very well designed and with a very advanced development. The encoders in R-Keras are fairly useful but not was advanced as those in Mathematica. Mathematica: Wolfram Research repository of neural networks; can import externally trained networks in MXNet format. R-Keras: has commands loading for pre-trained models, . F. Chollet, J. J. Allaire, Deep learning with R, (2018). J. J. Allaire, Deep Learing with R notebooks, (2018), GitHub. Wolfram Research, "Neural Networks in the Wolfram Language overview". Wolfram Research, "Machine Learning Webinar Series". Wolfram Research, "Neural Networks guide". I volunteered and committed to give a talk about using Deep learning in R through Keras for the Orlando Data Science and Machine Learning Meetup. The people in that group mostly use Python, but R/Keras was considered interesting enough. Another thing is that with Mathematica I can much easier illustrate and visualize some analogies to "shallow" non-neural network algorithms. Since the presentation was going to be relatively short compared to the material I wanted to cover, I decided to start a GitHub project that provides a systematic exposition of the considered functionalities and applications. At that point making a Mathematica-vs-R project made lots of sense. Obviously, comparing the two systems is a good way to learn about neural networks. After my presentation fair amount of the attendees were interested in Mathematica. I did tell to the group that if they a serious about figuring out and mastering Deep learning they should get hold of Mathematica.